Blood pressure is the pressure of blood in your arteries. The higher your blood pressure, the greater your risk of stroke, heart attack and heart failure. Blood pressure varies constantly with your level of physical exertion, and with anxiety, stress, emotional changes and other factors. Obese people or those who drink excessive amount of alcohol are more likely to develop hypertension. No one can afford to ignore raised blood pressure, because its complications cause more deaths and severe disability than any other group of diseases. 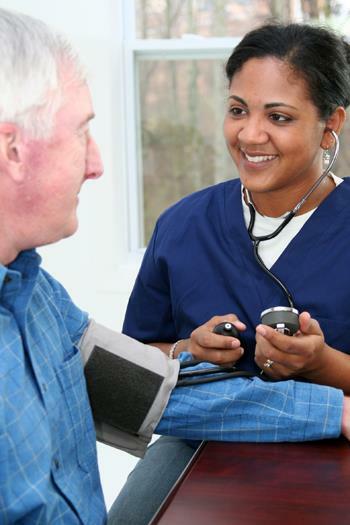 Hypertension has to be looked for and every adult should have regular blood pressure checks. Fortunately, proper and effective treatment can largely eliminate the additional risk of these serious complications. For many people change in eating habits, regular exercise, a low-fat diet, quitting smoking, and reducing the amount of salt and alcohol consumed will often be enough to get blood pressure down to normal levels. If lifestyle changes are not successful, then drug treatment may be necessary. Your treatment would be regularly reviewed. If you make lifestyle changes and your blood pressure returns to a normal level, your GP will be able to advise you about coming off your medication for a trial period. Please feel free to book in to see one of our Health Care Assistants for a routine blood pressure check or better still a well person check. SMOKE a cigarette 1 hour prior to your appointment. Being overweight commonly leads to increased blood pressure as well as to many other health problems. For example, if you are overweight you are more likely to develop diabetes, heart disease and some cancers. The health risks from being overweight are much greater if you also have high blood pressure, diabetes or high cholesterol. Symptoms like back pain, tiredness and breathlessness are also caused or worsened by being overweight. Losing weight can help restore your energy, mobility and vitality so that you should be able to lead a longer, healthier life. The more you weigh the higher your blood pressure is likely to be. If you are overweight, then losing 22 pounds (10kg) can help lower your systolic blood pressure by 5 - 10mmHg. If you combine weight loss with other lifestyle changes, like being more active and eating less salt, you should see even larger drops in your blood pressure. Everyone has an ideal weight. Your ideal weight will depend on how tall you are and whether you are male or female. If you are overweight you should try and get down to a weight within the ideal range for you.